It’s times like these you know Silicon Valley stereotypes exist for a reason. Dropbox, the multi-billion-dollar firm that helps store files on the cloud, today unveiled what it clearly thought was a bold new identity. 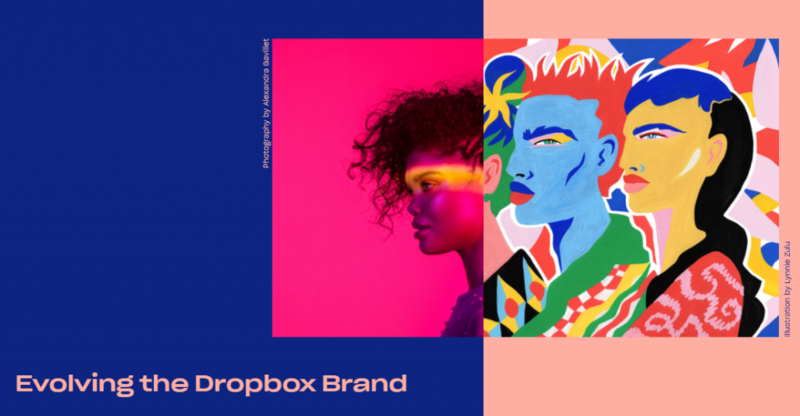 While other companies would’ve put out a press statement, or released logo, Dropbox went to full hog — it created a whole new website explaining its newfound brand ethos. “Dropbox isn’t just a place to store your files—it’s a living workspace that brings teams and ideas together,” proclaimed the site. And Dropbox sought to bring teams and ideas together with some art that looked straight out of a surrealist museum — strangely drawn human figures merged into pictures of real human beings, and unusual colours jumped at the user. The infinitely scrolling site narrated the story of Dropbox’s new design through hip-looking gifs, essays about typefaces, and more surrealist paintings. Now Dropbox was supposed to just be this place to store your files, not exactly a place “to inspire creative energy.” Twitter was very confused, and for what was a design update, Dropbox began getting some pretty harsh feedback. Scrolling that website is the worst thing I experienced on the web in the last few weeks. Some other people reported that the design-focused site didn’t seem to have the best design itself. And the site was so chock-full of Silicon Valley tropes that some people thought it was a joke. This is chaotic, garish, hard to read, extremely unfriendly. I hope this site is a joke. Seriously? Is it April 1st already? Some people couldn’t wrap their heads around the new colours. Yeah but think of it this way – any time you now see dried blood on baby clothes you'll think "DROPBOX!" And people wondered who’d come up with the bizarre design. And people also didn’t miss their chance to diss the new Dropbox logo, which now has an extra square. “We’ve evolved it from a literal box, to a collection of surfaces to show that Dropbox is an open platform, and a place for creation,” the company had said. You guys were thinking so outside the box, you missed the actual box. And some people were so angry at the new design they threatened to leave the service. Really hope those horrendous colours don’t make their way into the apps and website. If so, I’ll be moving to a different service. And the burns just kept coming thick and fast. Are you serious? That site needs an epilepsy warning or something. It’s not unusual for design changes at public facing companies to be met with outrage — people often get used to how their favourite products are supposed to look, and don’t take kindly to changes. But Dropbox managed to annoy people before even incorporating its design changes into its product. It’s quite something to have people threaten to leave your service just by going through a website in which you try to explain your design philosophy.